It had been an emotional past week when our Prime Minister Mr Lee Hsien Loong declared a seven-day period of national mourning for Singapore’s Founding Father and former Prime Minister Mr Lee Kuan Yew, who passed away on 23 March Monday morning aged 91. We were very sad. 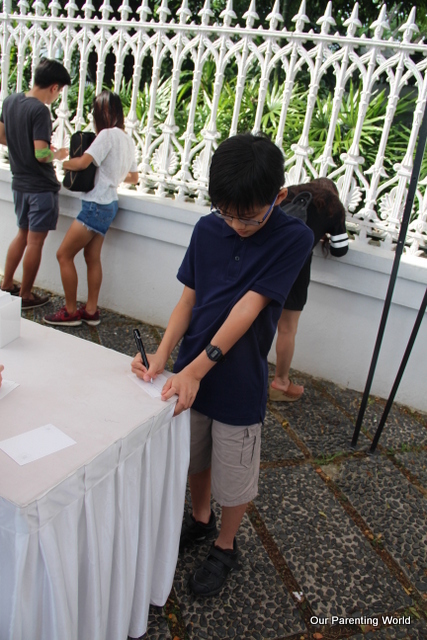 Many people queued up for hours some as long as 10 hours wait to pay their respects to Mr Lee Kuan Yew during the Lie in State (LIS) at The Parliament House. 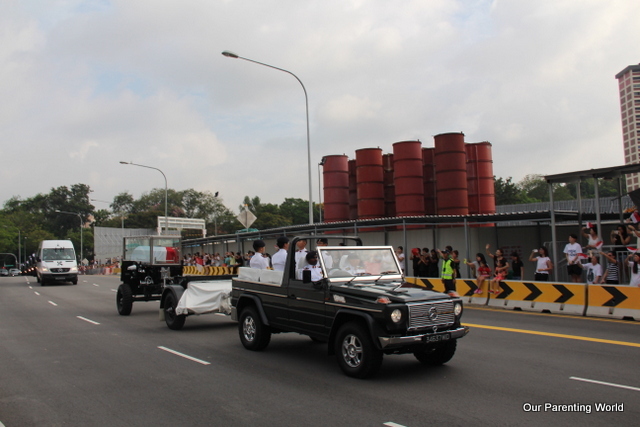 18 tribute sites across Singapore had been set up for people to pay their respects. 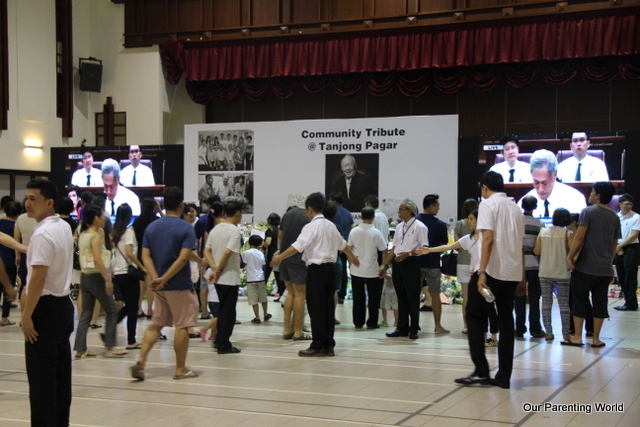 This is the tribute site at Tanjong Pagar Community Club (CC). Tanjong Pagar is the area where Mr Lee Kuan Yew has been serving as a Member of Parliament for the last 60 years. This is the tribute site near the Istana’s main gates. Istana is the official residence and office of the President of Singapore. This is also the working office of the Prime Minister of Singapore. It is really touching to see so many people coming to the tribute sites expressing their thoughts, heartfelt thanks and to offer their condolences at The Parliament House and various tribute sites. 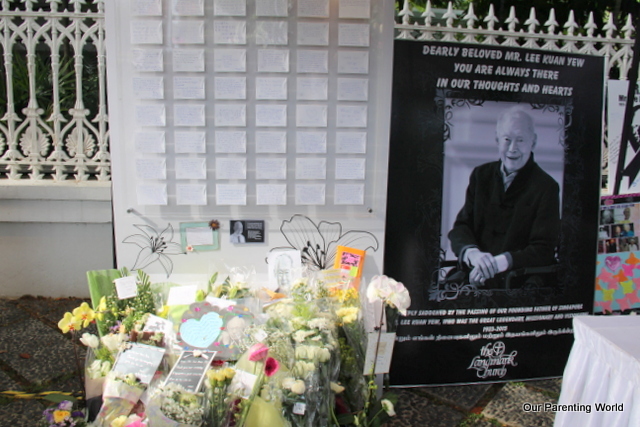 I saw many people visibly shaken and were crying for Mr Lee Kuan Yew. I feel very sad. I thank Mr Lee Kuan Yew for his contribution to Singapore and without him, Singapore won’t be what it is today. I thank him that I can go to school, have my education, grow up to be able to pursue my dreams in a safe country. I thank him for everything! I will miss him. Thank you Mr Lee Kuan Yew. My little brother is four years old and I have been sharing with him about Mr Lee Kuan Yew and wanted him to know more about Mr Lee. When we grow up, we will be going to National Service and to serve our nation. 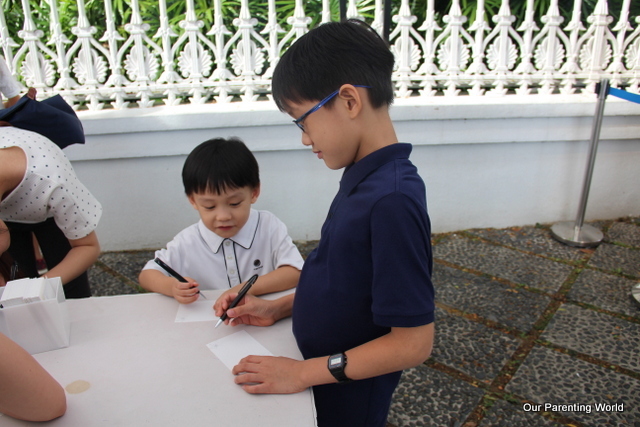 My little brother has been practising to write ‘Thank you, Mr Lee Kuan Yew’ before coming down to the tribute site. My uncle who is working in Hong Kong brought his family to pay tribute and watch the live telecast of the state funeral. 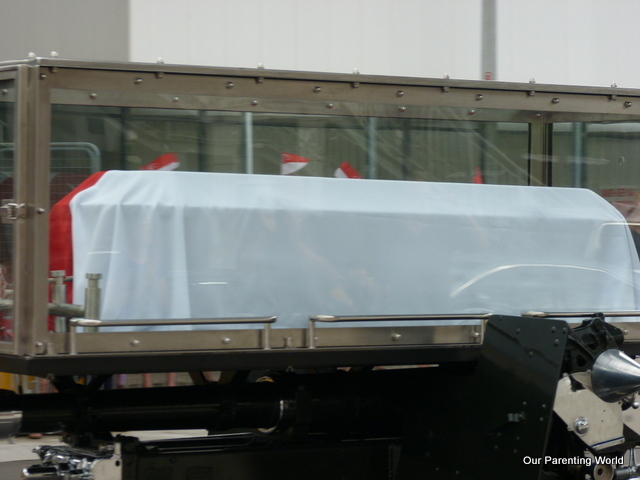 On the 29 March 2015, is the day of Mr Lee Kuan Yew’s State Funeral, it was raining very heavily that day. Everyone felt the loss and pain to bid the final farewell to a great man. 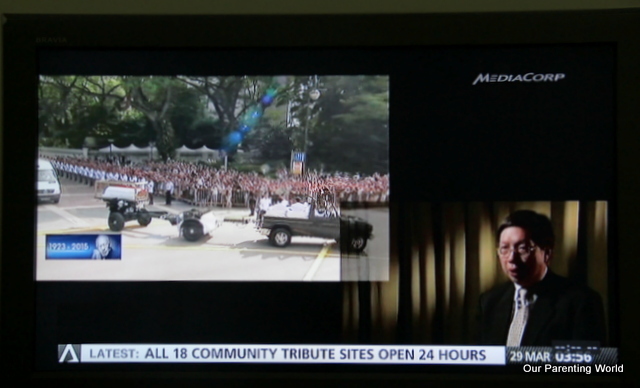 Most shops were closed on that day to mark the respect for Mr Lee Kuan Yew, many lined up the streets to pay their final tribute, gathered around the tribute sites and at home to tune in to watch the live telecast of the State Funeral. Please click HERE to find out more. 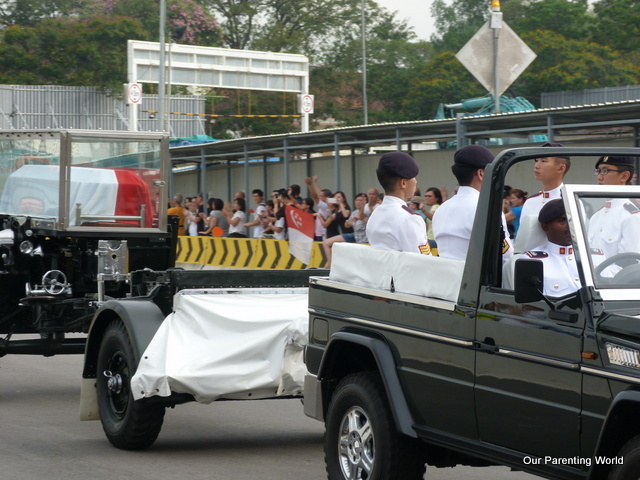 Many people lined up on the streets including us to bid our final farewell to Mr Lee Kuan Yew. People were waving the Singapore’s flags and shouting ‘Mr Lee Kuan Yew’ and ‘Thank you, Mr Lee’. 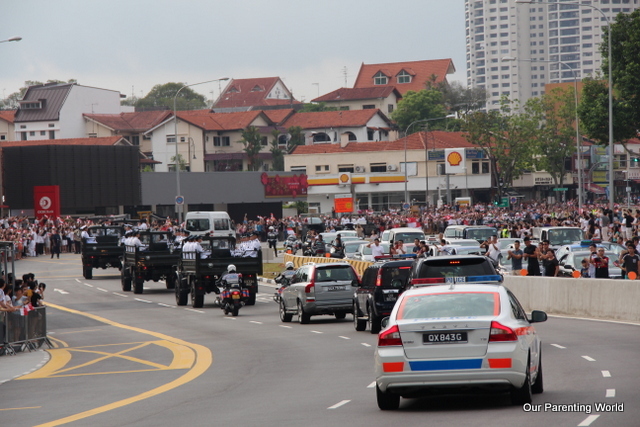 My mummy and an old lady standing besides her were tearing, emotions went high when Mr Lee’s cortege passed by. It’s very sad, we felt the loss in our hearts. 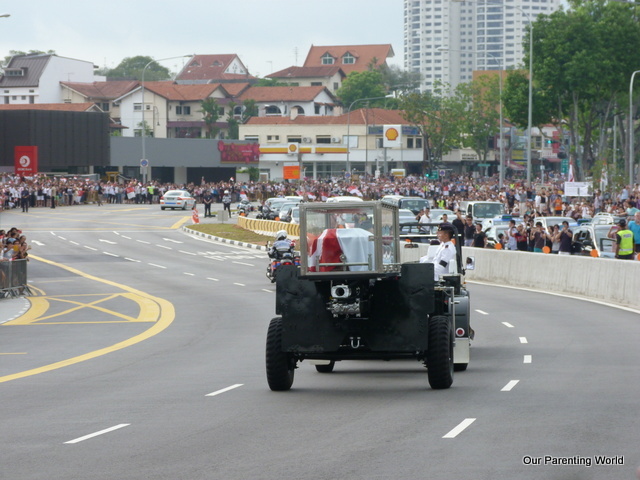 Mr Lee Kuan Yew is clearly well-loved, we have never seen the streets of Singapore lined up with tons of people waiting to bid their final farewell to a great leader like him. It has been an emotional week for many of us and I am deeply inspired by Mr Lee Kuan Yew after listening to his stories in school and at home. He is well respected and admired in Singapore and overseas. He led Singapore to independence in 1965. Despites Singapore being a small country and lack of natural resources, under his leaderships, he made Singapore one of the most prosperous country in the world and the best place to live in. He is a brilliant architect, he made Singapore a clean, green and beautiful country. Singapore has scored many 1st and best in the world like our Changi Airport. Thank you Mr Lee Kuan Yew for your valuable contributions, may you rest in peace and we will remember you forever deep in our hearts! 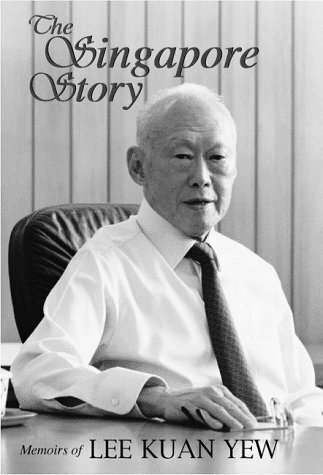 Please click HERE to find out more about our Singapore Founding Father, Mr Lee Kuan Yew. 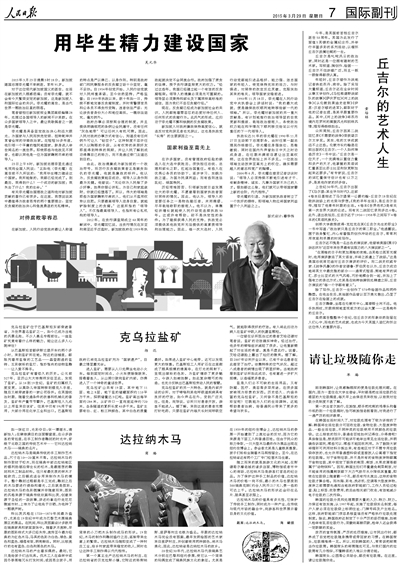 My Grandfather’s article on Mr Lee Kuan Yew 《 用毕生精力建设国家 》published in China’s 《 人民日报 》on 29 March 2015. My Dad was interviewed by Channel NewsAsia to share how Mr Lee Kuan Yew has helped to shape the Healthcare system in Singapore. Singapore has progressed to being one of the best in the world. Thank you Mr Lee Kuan Yew, our Founding Father and you are forever in our hearts. We will remember you and your legacy will live on. We will carry on your legacy and make Singapore an even better place to live in! 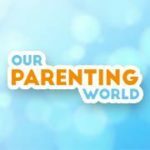 Article Contributed by Vincent, Primary 4 boy from Our Parenting World (OPW) Team. When I woke up early in the morning to prepare to go to school on the 23 March 2015, I heard that our founding father and first Prime Minister, Mr Lee Kuan Yew has passed away. Our country and the world have lost a great leader. Mr Lee has helped to build Singapore for what it is today and put us on the world map. 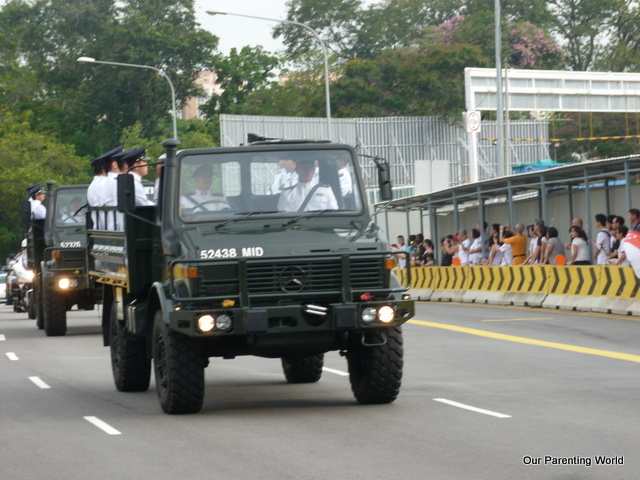 Singapore has progressed rapidly from a third world country to a first world country under his leadership. When I reached school, my friends and I were all talking about him and we wanted to find out more about him. I found out that my grandfather has interviewed Mr Lee Kuan Yew on many occasions. I was fortunate to find out more about Mr Lee through my grandfather as he shown me the newspapers clippings and explained to me how our founding father, Mr Lee Kuan Yew has created the modern Singapore today and we have all benefited greatly from his leadership. 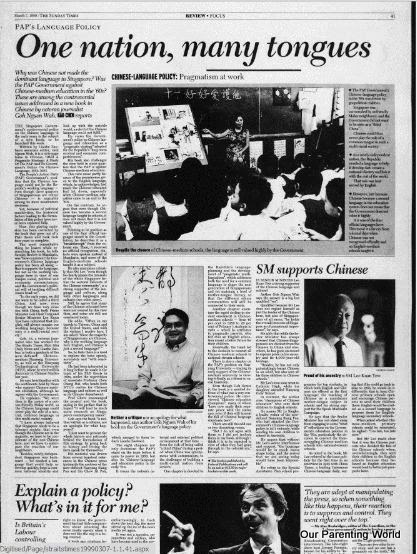 One of the articles titled “One Nation, Many Tongues” published in The Straits Times in 1999 that my grandfather had written about his interview with Mr Lee Kuan Yew on his opinion of learning different languages in Singapore. Mr Lee felt that other than being proficient in English, we should also be proficient in our mother tongue. Fast forward to 16 years later today, mother tongue still remain an important subject for the younger generation like myself in school. Thanks to Mr Lee’s vision on Singapore’s language policy, Singaporeans are not only excellent in English language to be able to compete in the world, but also proficient in our own mother tongue whether we are a Malay, Chinese or Indian. This made us culturally strong and build up a harmonious and multi-racial society. I will continue to update this write-up as I embark on my journey together with my classmates to find out more about Mr Lee Kuan Yew. We would like to thank Mr Lee Kuan Yew for his great contribution to our country and pay our tributes to him. He is a great man and he will be remembered forever! To find out more about our founding father, Mr Lee Kuan Yew and to pay tribute to him, please click HERE. Well done ! Looking forward to the next article! Great article and inspiring. Looking forward to more articles! Mr Lee Kuan Yew has done so much for our country. It is an inspiring article.